Whether you're building a brand new home or simply remodeling, your bedroom doors are important in creating privacy and comfort in your home. From grand entrances for the master bedroom, to smooth and sleek transitions into the guest rooms, there are a variety of bedroom doors to suit your needs. Options for interior doors come in a wide assortment of styles and materials, and bedroom doors are no different. When it comes to finding the right doors for your bedrooms, it is important that homeowners not only consider the appearance, but also the function and cost of their bedroom doors. Read on to learn more about the best styles and materials for your home's bedroom doors. Bedroom entryways—especially master bedrooms—are an opportunity to add a more decorative or flashy touch. While basic flush or panel bedroom doors are available for a clean and simple entrance, homeowners may also opt for more expensive styles like interior barn doors. Although barn doors are made to slide open and closed, flush and panel bedroom doors can be installed to either swing or slide. For large bedrooms, homeowners may also consider a set of french doors, which slide or swing open at the center to create a dramatic entrance. French doors with light curtains are an especially elegant way to separate master bedrooms from master bathrooms. Many bedrooms include additional doorways leading into bathrooms or closets. Since there is rarely a need to show off your home's closet door, simple and space-efficient bi-folding and sliding doors are often used to help preserve floorspace. Additionally, homeowners can maximize their floorspace by installing pocket doors, which slide completely out of the way into door-sized cavities in the adjoining wall. Pocket doors work well as doorways into a bathroom from a bedroom. The ideal option for budget-conscious homeowners, hollow-core bedroom doors are lightweight and easy to install. Built using either plywood or molded composite for an exterior skin, these doors have a hollow interior. This hollow interior, however, results in poor sound insulation and is highly susceptible to damage from dents and dings. Solid-core bedroom doors feel slightly more solid and closer to the weight of solid wood, as their interior is filled with a wood fiber blend. They provide far better sound insulation and durability for a still relatively low cost. Solid-core doors are a popular compromise between solid wood and hollow-core bedroom doors. Traditionally favored for its sturdy weight and classic appeal, solid wood bedroom doors offer the far better sound insulation than hollow or solid-core doors. While they tend to be the most expensive door material available, many homeowners feel that their solid wood door's durability makes this door a worthwhile investment. For homes and bedroom doors that are exposed to either prolonged humidity or extreme temperatures, some homeowners may also choose medium-density fiberboard (MDF) doors. This alternative material is naturally resistant to warping, and is often prized for its durability and affordability. When it comes to finding the best bedroom doors it's usually best to consider your budget, floorspace, or sound insulation needs, as well as your individual tastes. Fancier models like barn or french doors are excellent for master bedrooms. 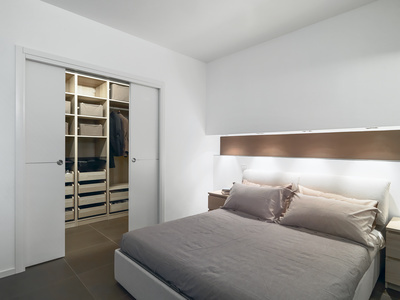 Simple flush or panel doors are strong choices for smaller bedrooms.